Construction of the Bishop’s Palace (later the Archbishop’s Palace) began on May 1, 1849 and was nearly completed by the end of that year. It was built to provide a residence and office for Bishop Guigues. 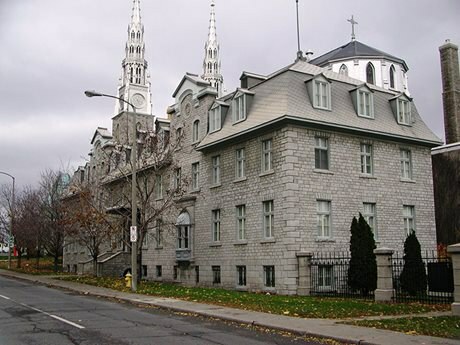 To foster the development and influence of the Roman Catholic Church, Guigues founded the Collège de Bytown (forerunner of the University of Ottawa) in 1848 and the Société de Colonisation in 1849, a settlement company to accelerate the arrival of French Canadians in the Ottawa Valley. The second Bishop and first Archbishop of Ottawa to reside in the palace was Joseph-Thomas Duhamel. The Bishop’s Palace became the Archbishop’s Palace in 1886 when Duhamel was elevated to an Archbishop by the Holy See. The building remains the residence of the Archbishop.